W.Bro. Alex McKenzie Celebrates Sixty Years in Mark Masonry. Thursday 17th November saw the latest official visit by Right Worshipful Brother Terence D. Sheern to Crowstone Mark Lodge, No. 945; it proved, as ever, to be a most interesting and varied evening. With the Lodge opened, the Provincial Grand Director of Ceremonies, W.Bro. 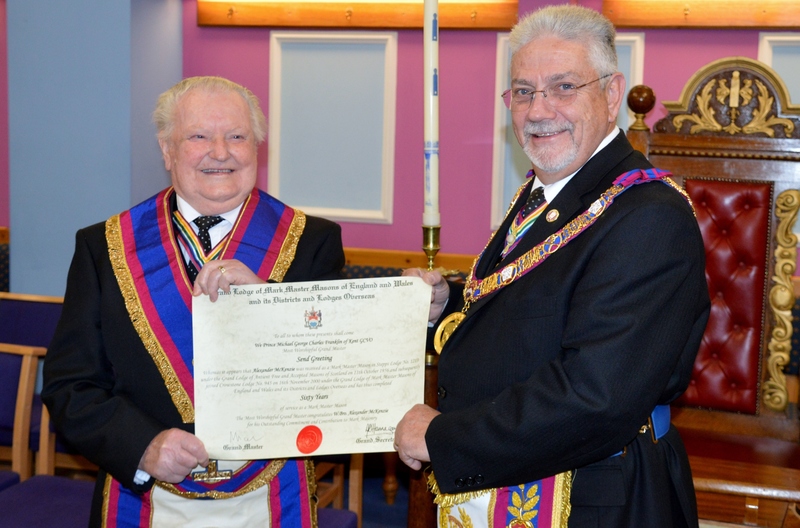 Mark Reeve, announced that the PGM was outside the door of the Lodge with a retinue of Provincial Officers and that he demanded admission; he was admitted with acclaim, along with his team, and greeted by the W.M., W.Bro. David Wilson. As is his usual custom, The PGM accepted the gavel and occupied the Master's Chair for a short while to greet members of Crowstone Lodge and to introduce his Active Officers. He also was pleased to acknowledge the presence of the Craft Deputy Provincial Grand Master, attending as a visitor from The Whitestone Lodge, No. 864, Brother (in this degree) Paul Reeves. With the W.M. back in his place, the business of the evening proceeded. This was carried out to everyone's satisfaction, the W.M. was proclaimed as such for a second year and he proceeded to install his officers in a fine, humorous and sincere manner. All addresses were given with accuracy and sincerity, the PGM delivering the Address to the Brethren. It was the PGM's pleasure to present two Grand Lodge Certificates to Brothers Kamal Khan and Geoff Newman following their recent Advancements. It was also most pleasing to hear that the Lodge had no less than four applications for Advancement from Master Masons, some of whom having been introduced in a recent Awareness Evening. The Lodge was to get their full value from the PGM who asked W.Bro. Alex McKenzie to be presented to him. W.Bro. Alex was to be presented with a 60 year certificate in Mark Masonry, no mean feat and it gave him membership of an elite Essex group of just 4 such Mark Masons! In a most moving and informative address the PGM gave us all a flavour of Alex's life and Masonic activities. Alex was originally a Scottish Freemason and was Initiated into Lodge Steppes, No.1213 in Glasgow. He was subsequently Passed and Raised in 1953, raised on 24th December in fact! Now, this being Scotland, things are rather different there, Alex took the Mark Degree in his Craft Lodge on the 11th October 1956, as the Scottish Constitution still sees Mark as an essential part of the progression through the "normal" Craft Degrees into The Royal Arch. 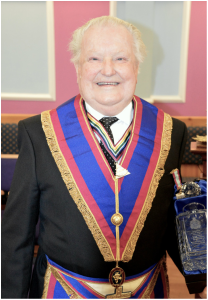 ​ Alex continued his masonic progress in Scotland before moving to Southend in the early 60's to work in the local printing trade. There he joined Thorpe Bay Craft Lodge, No. 4803 and, on the 16th November 2000, Crowstone Mark, No. 945. He progressed through the various offices becoming Master in November 2008, he was Elevated into Crowstone RAM on the 15th November 2001 and became Commander in 2009. Alex was subsequently appointed to Provincial Office in 2011 as Past Provincial Grand Standard Bearer and promoted in June this year to Past Provincial Grand Junior Deacon. The Provincial Grand Master was pleased to present Alex not only with his English Certificate, but with a letter of congratulations from The Grand Lodge of Scotland on his achievement. 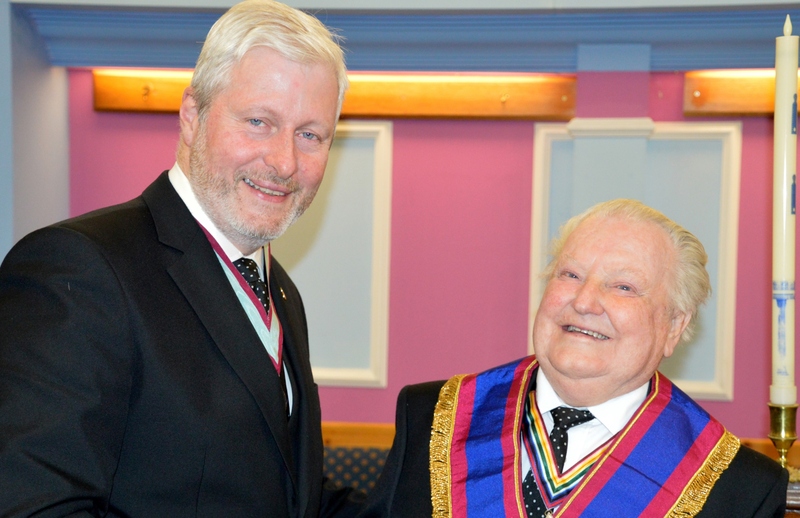 He was also delighted to announce that he was to receive a further promotion to Past Provincial Grand Senior Warden and looked forward to receiving him at Felsted where he could be formally appointed. Alex also received a wonderful, engraved, decanter from the Lodge along with a very special bottle to fill it from. All eventually retired to a most excellent festive board in the Jubilee Suite where the W.M., David Wilson, showing off his skills with a carving knife, neatly and amply sliced the roast ribs of beef which formed the centrepiece of the meal. The PGM, Provincial Officers and Brethren of Crowstone Lodge.